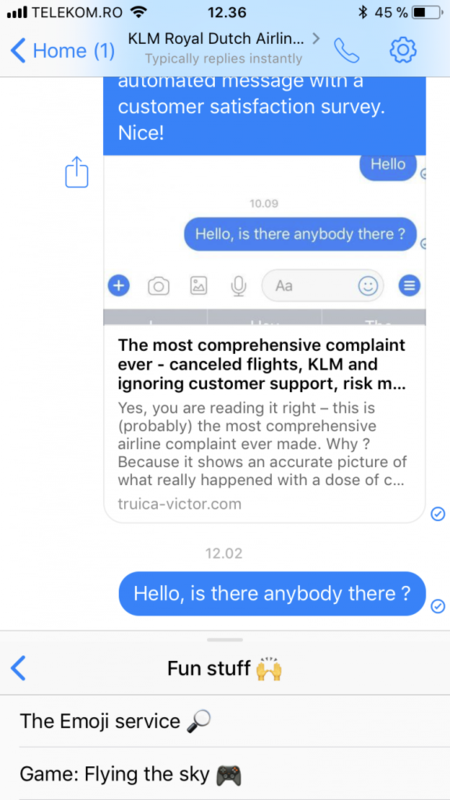 KLM is an european airline which is opened for almost 100 years but that is clearly not reflected in the customer support service. Apparently, KLM is quick to reply in visible places, such as Twitter. But not that quick on answering complaint forms. 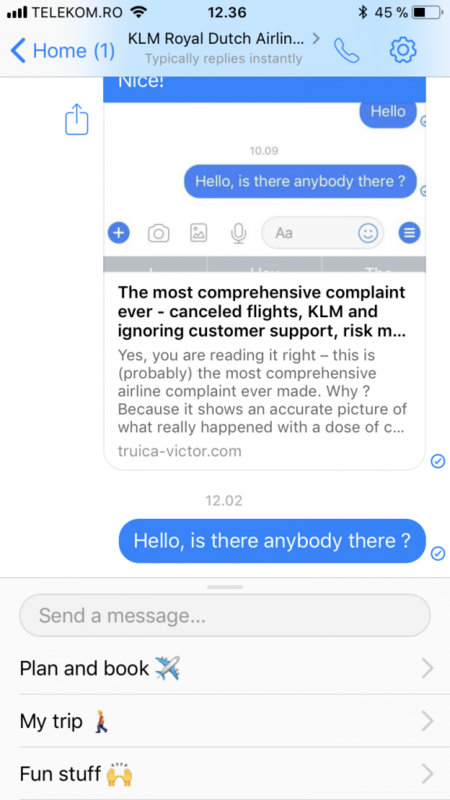 Of course, nobody actually sees the complaint forms, except for the affected passenger (me) and KLM support so why bother ? 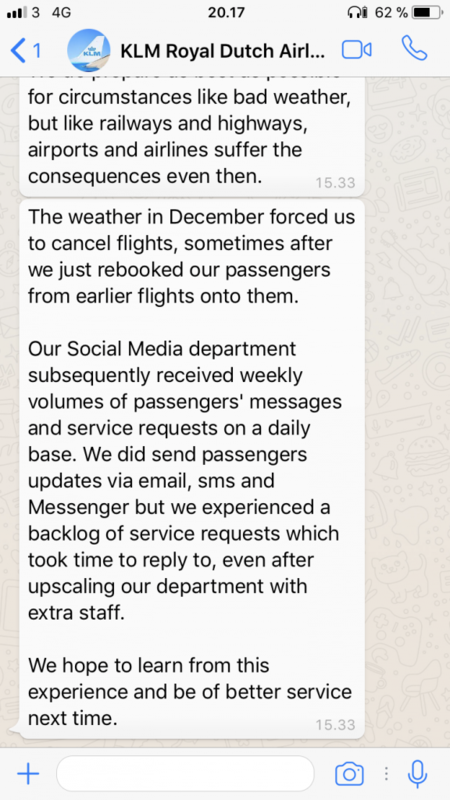 If that were true, I would have seen a reply to my complaint form, or on any support channel or a comment on the blogpost from @KLM support management or leadership. But i'm guessing, @KLM does not stress responding in cases that aren't too visibile to the public like Twitter ? Instead of having some useful categories of things to use in the Messenger bot, KLM added a ‘Fun stuff’ category instead of including a ‘Support‘ category. The conclusion here is that ‘fun stuff’ is more important than proper customer service. Who would actually need ‘The Emoji serivce‘ ? What was the reasoning behind this ? KLM is asking me for to open a Customer Care file online, which I already did and mentioned it several times. This makes me think that they are actually not reading what I’m writing and are just typing from a script. I have already sent DMs to KLM but i have received no answer. I have forwarded my reference number on WhatsApp and I'm now waiting for your reply on the DM on Twitter to see if you are actually reading those messages before I send a reference number. 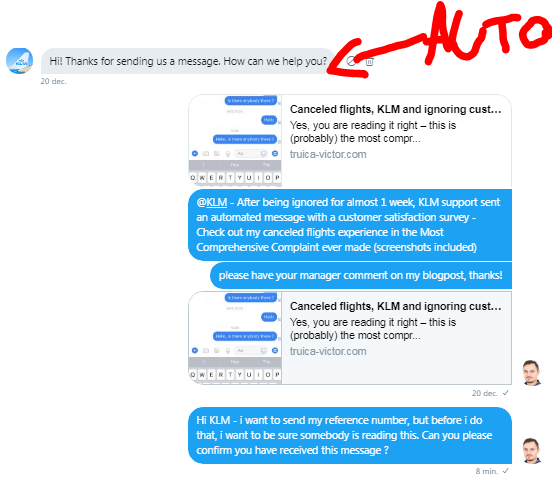 On Twitter DM, KLM is used to automated messages only, as I haven’t received any human reply so far. 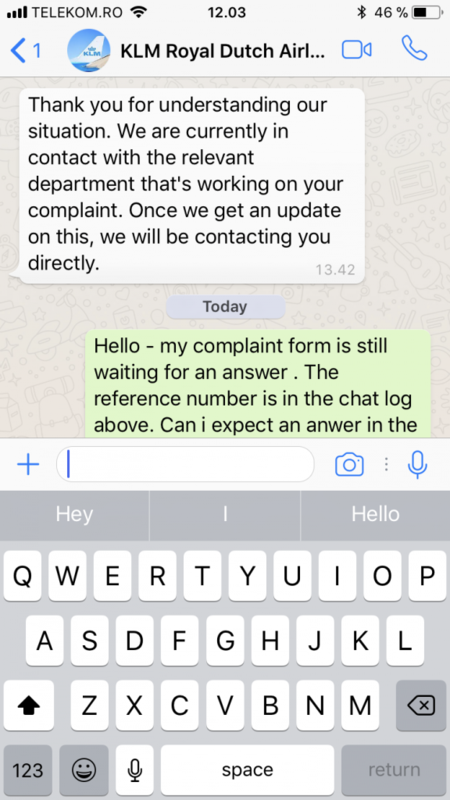 Update 4 – KLM support management finally replied. Not directly, no name mentioned but maybe it’s true. 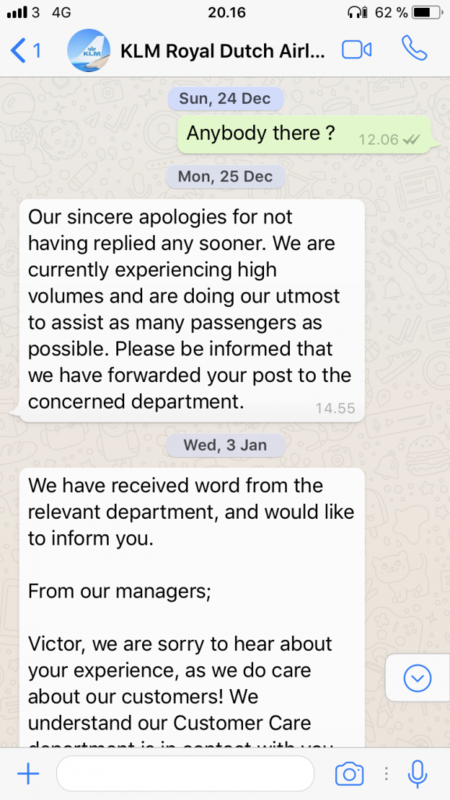 13-01-2018 – KLM acknowledged that they have received the receipts and informed that a refund will be done within 3-4 weeks. The only issue was that the total amount refunded wasn’t the total amount from the receipts, which led to another email asking why. 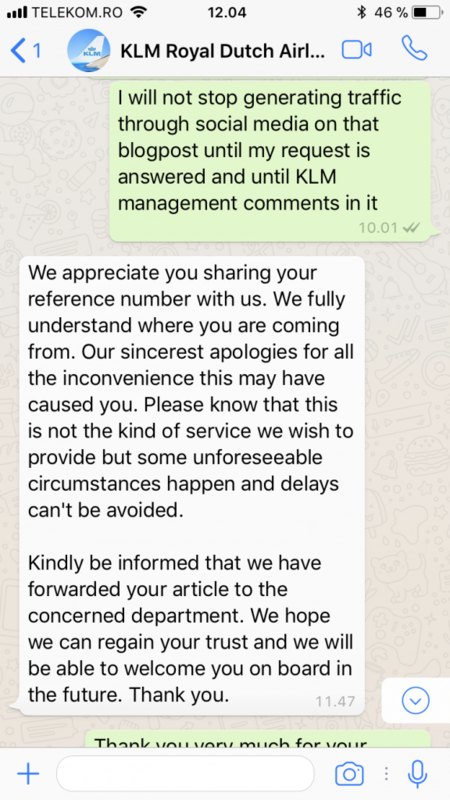 17-01-2018 – KLM acknowledged that it was a mistake and the remaining amount will be refunded accordingly. 22-01-2018 – the first part of the refund got into my account. Much faster than initially mentioned, but I’m guessing it’s better to under-promise and then to over-deliver and not the other way around. 31-01-2018 – the 2nd part of the refund reached my account. Again, faster than initially mentioned. 2. 7,5 weeks is the time it took from the cancelation of the flight until the refund. 3. Twitter is the way to go. 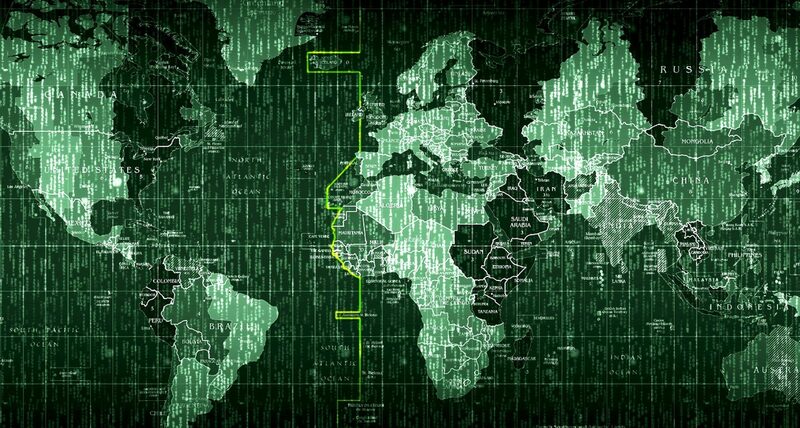 Even if they have multiple support channels, Twitter is the place where they are the most responsive, probably because of the level of public exposure.